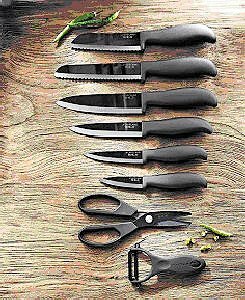 Lakeland the leading UK kitchenware specialist, has launched new and exclusive ceramic kitchen knives. These fine-looking knives boast black mirror-polished blades that slice with precision and will maintain their cutting edge far longer than conventional forged steel knives and will rarely, if ever, need sharpening. For many of us, cooking a lavish Christmas lunch can be an extremely daunting task, especially when you are inviting multiple guests around for the occasion. The secret to delivering the perfect festive meal is simple – plan ahead and be prepared! With Christmas fast approaching, it’s about time to start planning to get you and your kitchen ready for the big day. 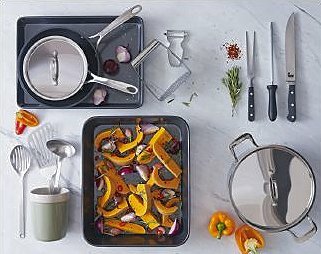 The new Jme collection from Jamie at Home, offers an array of cookware and gadgets to help take the stress out of cooking this Christmas and ensure your day runs smoothly from start to finish. Knife, plane or wire – how do you like to slice your cheese? Three new cheese slicers from the Kitchen Devils Sidekicks’ range are now available for British Cheese Week. With over 700 cheeses produced in the UK it is safe to say we are a nation of cheese-lovers. Having graced our dining table for years, Rosendahl’s Grand Cru range is now moving into the kitchen, with the launch of a sharp and elegant range of kitchen knives. Grand Cru Kitchen Knives – The Grand Cru range has now expanded to include a beautiful range of Kitchen knives – with cutting-edge blades and cutting-edge design. The design of the knives pays homage to Nordic tradition, where the distinctiveness of the design, plays a discreet part in the function of the item; thus, the familiar grooves of the range serve as a design feature, but they also help to ensure a good grip of the shaft of the knife. 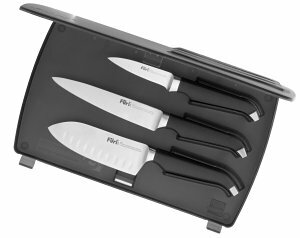 Furi are renowned for their professional top-of-the-range knives and the Furi Grip Range, which incorporates innovative technology in the knife handles for ultimate comfort and grip. 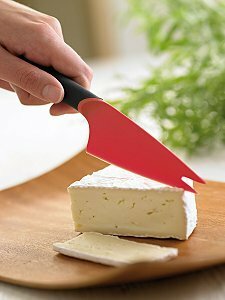 The unique reverse-wedge Furi handle shape, features synthetic rubber for excellent grip fit and comfort and also includes Furi Guard, a proven effective antimicrobial agent that does not wash off or wear away and helps to prevent the development of bacteria. Oysters are one of the great pleasures for true epicureans, but they are one of the most complex foods to get at – and all too often minor or worse accidents happen. 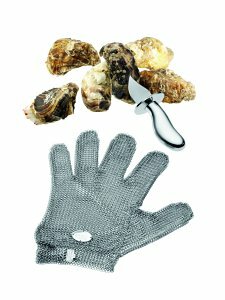 The Oyster Chucker, Marisco, is a knife specifically designed for opening oysters and the stainless steel glove will keep you safe doing so; the glove is in meshed stainless steel with a fixture on the wrist to prevent it sliding down. The glove is reversible and fits on either the left or right hand. 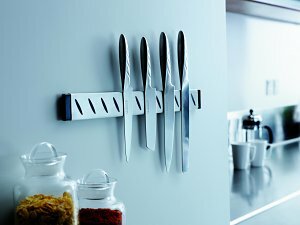 Rosendahl has launched a beautiful, practical and highly functional magnetic knife holder to compliment their knife range, designed by Komin Yamada. When you have invested in a high-quality set of kitchen knives it is essential that you look after them correctly; if they are just left in a drawer, they can become scratched, dull and damaged and no longer cut as they should – worse still, they can slip and cut you instead! 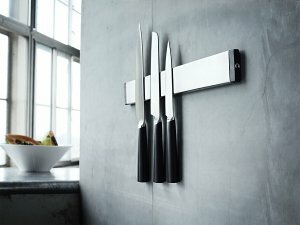 The new Magnetic Knife Holder from Rosendahl is easily attached to the wall and since it is 45cm long it can hold lots of knives. 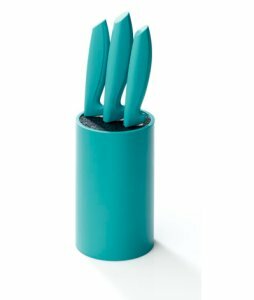 The design on the knife holder of the characteristic five grains of rice, also adorns the knives and it really looks stunning in the kitchen! 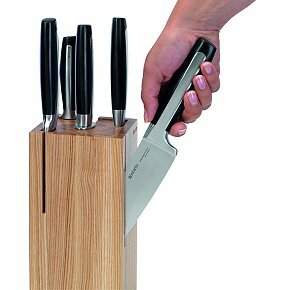 The magnetic knife holder retails at £51.95.